Jogging and jumping jacks are popular movements for aqua exercise. These exercises can be used together to create a simple, yet effective total body workout. Watch the video to see how to use the water to burn more calories. Know your working effort and you will be on your way to melting more calories and boosting heart health. Change your Effort. Burn More Calories. 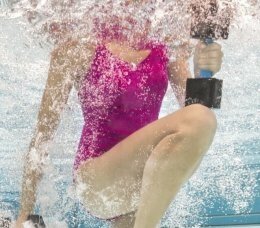 What’s the most important factor affecting how many calories you burn in your water workout? You might be thinking: exercise longer, work harder, or add more equipment. The real answer is much more nuanced. Achieving your fitness training goals and burning more calories requires being aware of the effort you’re putting into each workout. It’s one thing to say you’re working hard, it’s another to learn how to quantify your effort. Optimal intensity does not mean keeping up to the person beside you. You could be working at the same speed as your neighbor in the pool and be using half or twice the effort. It's important to move at a pace that's right for you. Let's take the example of riding a bike to explain intensity levels. Somewhat easy to moderate is like coasting along in first gear, no pedaling required. Next, imagine you are shifting your bike into second gear. At this somewhat hard level, you’re starting to feel your heart rate increase and your muscles engage more. In third gear, you’ve moved into the hard level, where your heart is pounding and your muscles are really working; it should feel hard, perhaps a little uncomfortable. It's not a level you can maintain for very long. Knowing how hard you're working, is key to burning more calories and achieving better training results. Somewhat easy to Moderate: Breathing and heart rate a little faster, feeling warmer. Still somewhat comfortable, but becoming noticeably more challenging. You may compare this to a brisk walk or walking up a slight incline. You can say 4-5 words before having to take a breath. Somewhat Hard: Breathing harder, heart rate increasing, working at a pace you can maintain for an extended period of time with some challenge. You have to breathe through your mouth—nose breathing is not enough to give you the oxygen you need. You can say 3-4 words before having to take a breath. Hard: Heart is pounding. Borderline uncomfortable and cannot be maintained a long time. Short of breath, you can say 2-3 words before having to take a breath. Know Your Intensity, Improve Your Results. Cardiovascular exercise involves movement that gets your heart rate up. When you’re doing this type of exercise, you should vary your effort and include spurts at a somewhat hard to hard intensity. This will help you strengthen your heart, improve your aerobic fitness, and burn more calories. Varying your intensity also helps you recognize how hard you’re working and can be a simple way to put together your own workout. Research shows that varied levels of high intensity is more effective at reducing body weight and improving heart health than training at a steady pace.